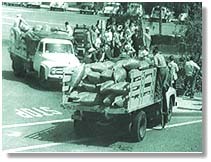 Remember the scene in the original black & white version of "THE INVASION OF THE BODY SNATCHERS" (1956) where the hero and heroine watch the giant pods being unloaded from trucks in the town square? Well, that was actually the town square of Sierra Madre, CA., a small town just north of Santa Anita race track (and just northeast of Pasadena). The town square is located at the intersection of Baldwin Avenue and Sierra Madre Blvd. 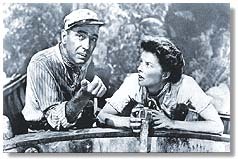 You certainly remember the scene where Humphrey Bogart & Katharine Hepburn trekked through leech-infested waters in 1951's "THE AFRICAN QUEEN." That, and may other Hollywood scenes were filmed at the lagoon inside the Los Angeles State & County Arboretum in Arcadia (301 N. Baldwin Avenue, Arcadia). Since 1936 (when it was the location for "TARZAN ESCAPES") the park's lagoon (known as Baldwin Lake) and its nearby prehistoric jungle garden have been used in over 100 movies over the years, including the 1997 horror film "ANACONDA," "MATILDA" (with Danny DeVito), Disney's 1998 version of "THE JUNGLE BOOK: Mowgli's Story," eight "TARZAN" films, 1940's "SAFARI" (with Douglas Fairbanks), 1946's non-musical version of "The King & I" : "ANNA & THE KING OF SIAM" (with Rex Harrison & Irene Dunne), the Hitchcock thriller "NOTORIOUS" (with Cary Grant), the classic miniseries "ROOTS," Bob Hope & Bing Crosby's "THE ROAD TO SINGAPORE"... even once scene from "THE LOST WORLD: JURASSIC PARK." In the 1950 classic "SUNSET BLVD.," William Holden's character, 'Joe Gillis', lived in a simple Hollywood apartment building, before he made the mistake of moving into the dreary Sunset Boulevard mansion of fading screen star, Norma Desmond. That apartment building is actually the Alto-Nido apartments, and it can still be found at 1851 N. Ivar Street (between Yucca Street and Franklin Avenue) in Hollywood, just one block northwest of Hollywood & Vine, and just north of the landmark Knickerbocker Hotel. It was once owned by actress Marie Dressler ("Tugboat Annie"). This apartment building is also supposedly one of the places Elizabeth Short, "The Black Dahlia", lived before her brutal murder. Hence, it was used in the 2006 movie, "The Black Dahlia". In that same movie, "SUNSET BOULEVARD," Paramount Studios' ornate, wrought iron entry gate is featured in a key scene where 'Norma Desmond' (Gloria Swanson) makes a dramatic return to the studio, driving through the arch in her classic automobile. From Melrose Avenue, in Hollywood, just look north up Bronson Avenue.